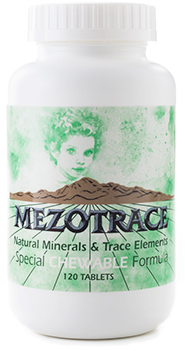 The chewable tablet is composed of Mezotrace® minerals and trace elements with some natural citrus juice added. Ingredients: MEZOTRACE Natural Carbonate Mineral Complex, Pure Crystalline Fructose, Vegetable Stearate, Cellulose, Natural Flavor, Silicon Dioxide, Magnesium Stearate and Chlorophyll. Magnesium is something I focused on for a long, long time and I think is one of the key elements in helping repair people’s biology,” Dr. Hyman says. “It’s a macromineral of which most of us are deficient, and this is responsible for many, many symptoms. Magnesium is responsible for over 300 enzyme reactions and is found in all the body’s tissues.